The Afghanistan Ministry of Public Works recently visited the University of Maryland and had a special tour of the Center for Advanced Transportation Laboratory. During their visit, Minister Najibullah Aoudjan and A. James Clark School Dean Darryll Pines signed a three-year Memorandum of Understanding (MOU). The goal of the MOU is to improve conditions the conditions in the areas of transportation research, education, and sharing of best practices. More specifically the University will collaborate on improving ways of managing the regions’ highways, sharing experience in transportation research, information exchange on providing safe driving conditions and sharing best practices. The Afghanistan Ministry of Public Works is facing many challenges as a result of a long and on-going war. The Ministry was most interested with the work CATT is doing with Maryland State Highway Administration on using Virtual Weigh Stations for commercial vehicle enforcement. One of the problems they have, as they rebuild their highway infrastructure, is policing overweight commercial vehicles which can damage their roadways if left unchecked. CATT director, Tom Jacobs will be working with the Afghanistan officials to accomplish the goals of the MOU. 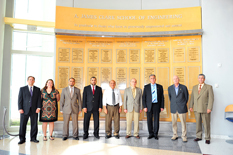 The Center for Advanced Transportation Technology (CATT) in the A. James Clark School of Engineering Department of Civil and Environmental Engineering at the University of Maryland, College Park, was created in order to respond to the significant changes brought about by increasing use of advanced technologies in the transportation field. A permanent staff of ITS professionals and affiliated faculty of the Department of Civil Engineering supports CATT. All offer extensive knowledge and experience in the areas of ITS technology, traffic engineering and control, systems analysis, and operations research. Visit CATT on the web at www.catt.umd.edu.